Note that the historical county of Brecknockshire and its county town of Brecknock are also known, respectively, as Breconshire and Brecon, with both forms being used in official documents. However, the Brecknock Poor Law Union was always referred to as such. 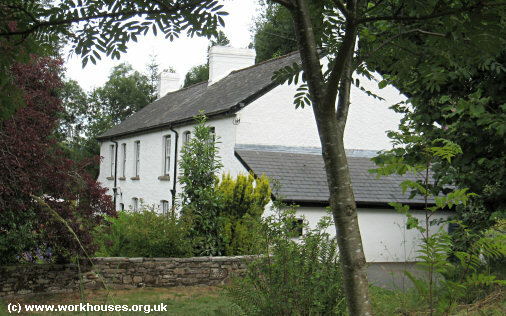 The parish of Llanddetty operated a parish workhouse located around 1.5 miles to the west of Llangynidr. 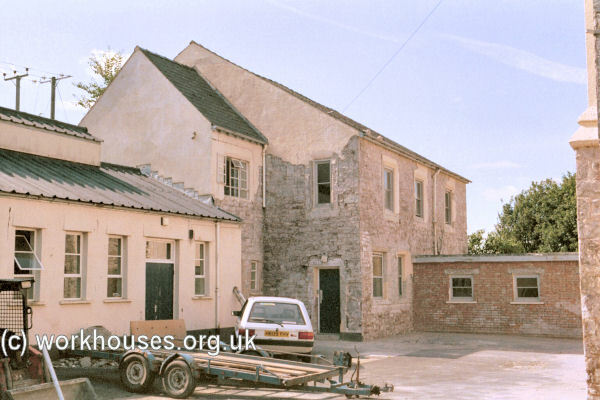 The building is now a residential property known as the Old Workhouse. Llanddetty former parish workhouse from the west, 2010. Brecknockshire: Aberyscir, Battle, Christ's College, Brecon — St. Davids's Upper and Lower Division or Llanfaes (2), Brecon — St. John the Evangelist (2), Brecon — St. Mary's (2), Cantref and Capel hant dû, Cathedine, Cray, Garth Brengy, Glynn, Glyn Tawe (or Callwen), Llanddetty, Llanddew, Llandefaelog (or Llandefaelog) fach, Llandefailog (or Llandefaelog) tre'r Graig, Llandefalle (2), Llandeilo'r Fan, Llanfigan (or Lanfeigan, Llanvigan), Llanfihangel fechan, Llanfihangel Nant Bran, Llanfihangel Tal y llyn, Llanfillo, Llanfrynach, Llangasty Tal y llyn, Llangorse, Llanhamlach, Llansaintfraed (or Llansantffraid), Llanspyddyd, Llanywern, Maescar, Merthyr Cynog (2), Modrydd, Pen Pont, Senny, Talachddu, Trallwng (or Trallong), Trawscoed, Trayan (or Traian) Glas, Trayan (or Traian) Mawr, Venny fach, Ysclydach. The population falling within the union at the 1831 census had been 17,550 with parishes ranging in size from Llandefailog tref Graig (population 47) to the combined parishes of Brecknock (5,002). The average annual poor-rate expenditure for the period 1834-36 had been £8,110 or 9s.3d. per head of the population. In 1838, the Poor Law Commissioners approved an expenditure of £2,649 on a workhouse for 100 inmates. 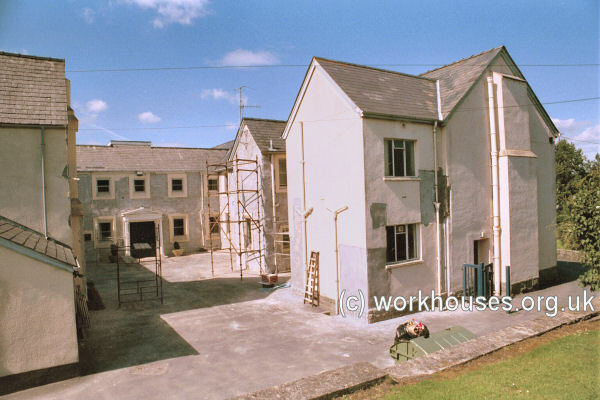 The workhouse was erected in 1838-39 on Bailihelig Road, approximately a mile to the south-west of Brecon. At the front, facing north-east, stood a long block with a central entrance. Brecknock entrance block from the south-east, 2000. To the rear, connected by a short central spine, was a parallel accommodation block. Brecknock from the south, 2000. 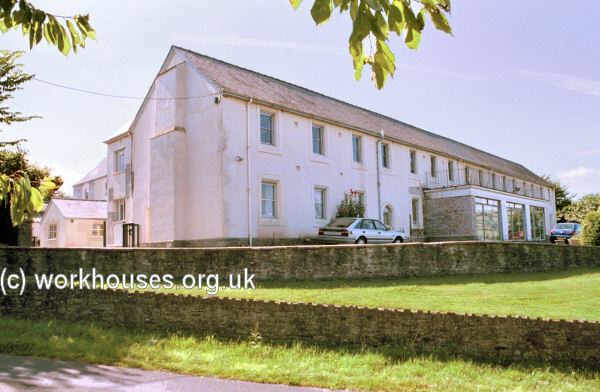 Brecknock rear accommodation block from the south, 2000. A separate block, probably the original infirmary, stood at the rear. 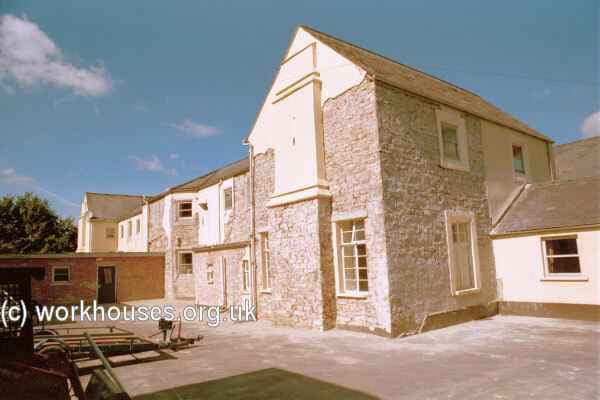 The workhouse later became St David's Hospital providing care for geriatric patients. This closed in the early 1990s and the site was taken over by the Christ College Public School for use as hall of residence. Powys County Archives Office, County Hall, Llandrindod Wells, Powys, LD1 5LG. Relatively few records survive. Holdings include: Assessment committee minutes (1862-80); list of paupers (1926-29) etc.